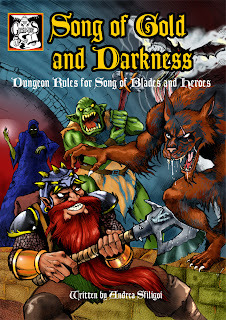 Hi, this is the cover for the dungeon supplement coming out in September. Comments welcome! A limited number of copies of SONG OF BLADES AND HEROES fast-play fantasy skirmish rules will be available at the Splintered Light table in the dealer hall at Historicon. Splintered Light will announce the skirmish packs. If you didn't buy the $4 pdf straight from the author at andreasfiligoi@gmail.com and prefer to have a printed copy in your hands, pre-order it now and drop by the Splintered Light table. Recruit your fantasy warriors and fight! 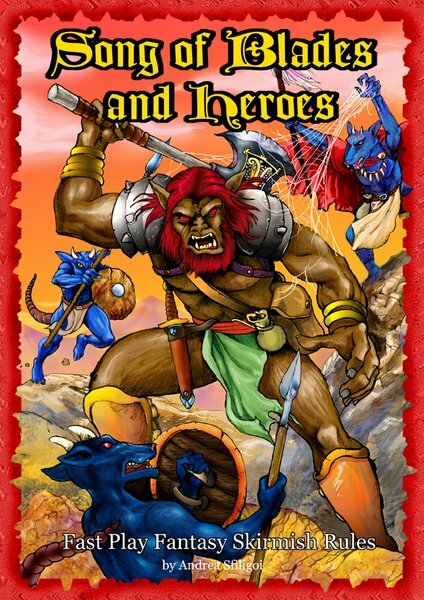 Song of Blades and Heroes is a fast play, skirmish level fantasy miniature system for two or more players. The rules are simple, fast, and above all FUN. CONVENIENT: the game needs little space -- a 60x60cm play area is enough. Bring all your armies in a shoe box! READY TO PLAY: stats for 180+ monsters and heroes are included, and you can create your own! SBH is the first of a line of games designed to be quick, inexpensive and requiring very little space. Skirmish packs of 15mm fantasy miniatures are available from www.splinteredlightminis.com. Every skirmish pack (Kobolds, Bugbears, Skeletons, Lion-Men, etc) has enough models to build a large warband. To purchase the e-book, please send $4 Paypal payment to andreasfiligoi@gmail.com (you'll be emailed the PDF and the cover files, make sure you have around 4 megabytes of free space in your mailbox). I'm doing the last minute changes to the layout and designing a cover- The PDF is ready and will be sent out for proofreading. We are almost there.